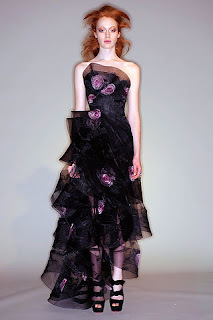 I thought I would share this amazing Marchesa Collection with you all. The designer Georgina Chapman said she was inspired by performer 'Lola Montez' and her travels and quest for love. I love this quote, and I really think that love is reflected in these pieces. The beading and the lace used in the designs are amazing... I hope you agree! Just WOW! Don't you agree? I'd actually like a wedding dress, based on ideas from these dresses - stunning!